What is a pre-money valuation? The valuation of companies shown on FundedByMe are pre-money, which means it's valued at its pre-investment round worth. A pre-money valuation is the value of a company before it receives outside financing, as opposed to a post-money valuation, which includes external financing or investments. It is important to distinguish between these two types of company valuations because the differences between the two values have a direct effect on the percentage of shares owned by both entrepreneurs and investors. If the company is valued at EUR 1,000,000 in a pre-money valuation, then it will be worth EUR 1,250,000 post-investment. In this case, after the investment takes place, the entrepreneurs will keep 80% of the total company’s value. Investors, in their turn, will own 20% of the company. 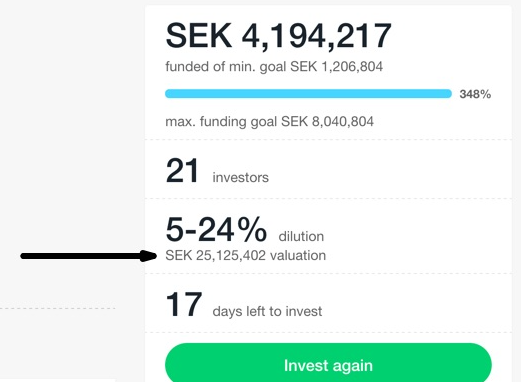 On the other hand, if EUR 1,000,000 is considered as a post-money valuation, the entrepreneurs will own 75% of the company, while investors will enjoy an increased share of 25%. Even though the differences between these numbers might be insignificant at a first glance, they might have a considerable effect on the financial outcome for entrepreneurs and investors when big amounts of money are involved.